From I-20, exit Matlock, go south and turn left on Bardin, right on Chasemore, left on Crestview, left on Shadow Crest and right on Fairhaven Ct. The home is on the left. Hello, I’m interested in 306 Fairhaven Court and would like to take a look around. 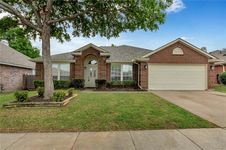 The details on 306 Fairhaven Court: This house located in Southeast Arlington, Arlington, TX 76018 is currently pending sale for $239,999. 306 Fairhaven Court is a 2,205 square foot house with 4 beds and 2 baths that has been on Estately for 4 days. 306 Fairhaven Court is in the Southeast Arlington neighborhood of Arlington and has a WalkScore® of 34, making it car-dependent. This house is in the attendance area of Williams Elementary School, Ferguson Junior High School, Ousley Junior High School, Seguin High School, and Kooken Education Center.